With this new technology, Analytik Jena AG is opening up new diagnostic possibilities with enormous potential and various applications. The new enrichment and isolation method is for example used in tumor diagnostics. Circulating cell-free DNA is also gaining increasing significance in pre-natal diagnostics, the diagnosis of metabolic diseases, or sports medicine. Free-circulating DNA occurs in plasma, serum, and urine, among other things, but only in small fragments and very low concentrations.The kit developed by the Analytik Jena subsidiary AJ Innuscreen GmbH is based on polymer-mediated enrichment (PME) technology. The cell-free DNA of the sample is combined with a polymer and then concentrated. The resulting DNA-polymer complex can be processed by means of a simple DNA extraction method. The kit is the first in AJ's polymer-mediated enrichment line, but adds to an already vast catalog of nucleic acid sample preparation kits. 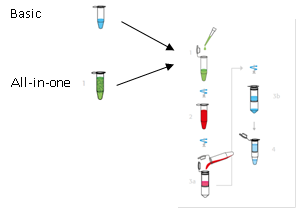 The life sciences division manufactures, for example, 12 different kits to isolate genomic DNA depending on sample sources and size of reaction. There are also kits for plasmid DNA, microbial DNA and RNA, total RNA, as well as kits for different PCR clean-up needs.